Whether you need to move one item or an entire household, at 1st class moving, we guarantee same or next day service and on-time pick-up and delivery throughout Twin Cities. The entire process is performed by qualified 1St Class Moving Twin Cities local movers so you can rest assured that your household items are in good hands. As local movers Twin Cities, we are experts in residential moves across all of the states and around Twin Cities. 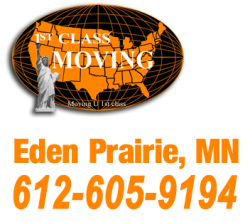 1St Class Moving Services holds all necessary licenses, permits and insurance required to provide household goods moving services in the State of Minnesota. MnDot # 376896. Our premier movers Twin Cities do things different from other Twin Cities local movers. As part of our Twin Cities moving services, we offer pick up at your current residence with a direct delivery to your new home. 1St Class Moving will safely and securely wrap, or box items that require special care just to make sure that your items can arrive safely at their destination. Time will start upon arrival at point of origin and ceases upon departure from point of final destination. Hourly rate charge for the labor required to load and unload the truck. We always assign the optimal number of movers to every job. Hourly rate charge for the vehicles required to transport your belongings. Packing materials are charged as used. If you are packed up and ready to go you will not be charge for the additional expense. glass or marble table top requires a cardboard crate, the foreman will advise you of the cost and the crate will be made on the spot.